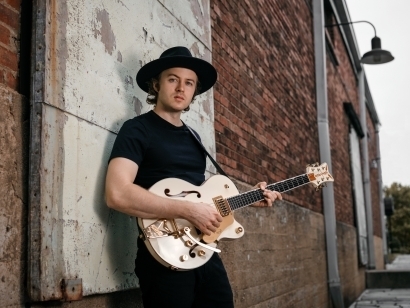 The final installment of The Mendel Center’s 2018-19 Hanson Theatre Living Room Series will feature world-class virtuoso guitarist and singer/songwriter Joe Robinson on Friday, February 22, at 7 pm. The twenty-seven-year-old Australian possesses a unique musical sensibility, injecting a fusion of rock, blues, R&B, and jazz into a fresh sound that is entirely his own. Displaying his virtuosity on electric as well as acoustic guitar, Robinson was voted “Best New Talent” in the Guitar Player Readers’ Poll and landed a coveted spot as one of Australian Guitar Magazine’s Top 50 Best Guitarists. Robinson started playing guitar at age nine and, when he quickly outpaced his guitar instructor, began educating himself via the internet. At age 11, he was a touring guitarist and at just 13 years old, he won the Australian National Songwriting Competition. Within a couple of years, he was touring regularly and sharing stages with artists such as Tommy and Phil Emmanuel, both of whom served as mentors. playing them expertly at the same time. In addition to extensive touring on his own, Robinson toured with Guitar Army featuring fellow master guitarists/singers/songwriters Robben Ford and Lee Roy Parnell in 2016. In 2017, Robinson joined guitar greats John Jorgenson and Lee Roy Parnell in Guitar Army on the road and in the studio. Robinson is currently writing and recording his highly-awaited fourth solo album, a follow-up to his well-received Gemini, Vol. 1 and Gemini, Vol. 2 EP’s, that is expected to be released in 2019. He has also been keeping a busy schedule on the road with solo dates and shows with Tommy Emmanuel, Edwin McCain, and opening shows for and as a member of Rodney Crowell’s acoustic trio. Tickets for Joe Robinson are $15 and available at www.TheMendelCenter.com, through The Mendel Center box office at (269) 927-8700, option 1, and in person weekdays from 10 am to 6 pm at the box office located in The Mendel Center, 2755 E. Napier Avenue, Benton Harbor. Discounts available for Mainstage and Economic Club members, seniors, students, and veterans. A wine bar and craft beers from local makers will be available beginning at 6 pm for attendees to enjoy throughout the performance. The Hanson Theatre Living Room Series is sponsored by the Southwestern Michigan Tourist Council. The Hanson Theatre Living Room Series is a live performance experience in the intimate setting of the 250-seat Hanson Theatre inside The Mendel Center at Lake Michigan College. The venue is designed for maximum viewing and listening pleasure and provides audiences with the opportunity to connect more closely with the performers and the performances.